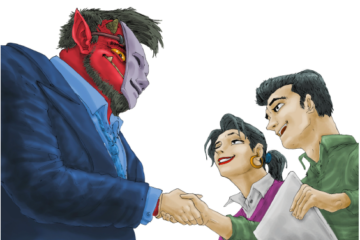 There’s a ‘gentle giant’ on the 100-peso bill, although you may not have noticed it. Billed as the biggest fish in the world, the whale shark or ‘butanding’ is known to grow up to 9 meters in length. Those who have traveled to Donsol in Sorsogon in southeastern Luzon know that they can interact directly with these fish. While in the past, local fishers tended to kill this slow-moving fish, eco-tourism has helped preserve their population. First identified in 1828 in Africa, this distinctly yellow-marked shark has a flattened head and a round, blunt snout―unlike most sharks, which have their mouths under the head. It also has a spiracle or vestigial gill slit behind its eye for breathing when it rests on the sea floor. The mouth has two barbell-like protrusions from its nostrils that give it a friendly, almost comical look. Overall, the butanding tends to be gray or brown with a white belly, and has vertical and horizontal stripes. These markings are unique to each individual of the species and can help identify them. Its skin can reach 10 centimeters in thickness, and females tend to be bigger than the males. It also has two dorsal fins towards the rear of its body and a two-lobed tail. 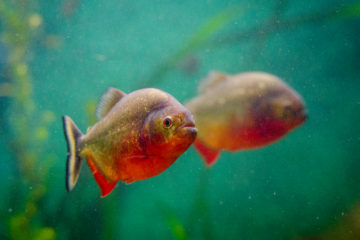 This accounts for their large mouths (with 3,000 teeth) and five pairs of gills. Only three shark species are known to filter feed, with the other two being the basking shark (incidentally the second biggest fish in the world) and the megamouth shark. Unlike other sharks, the butanding need not swim forward to feed; it can stay in a vertical position and simply bob up and down, swallowing water and filtering it for food. When it shuts its mouth, water leaves through its gills and whatever isn’t forced out through there is what the butanding feeds on. Unlike most sharks, which elicit a shudder of fear, the butanding is harmless to humans. Donsol is a seasonal feeding site for a large school of them, and you can go snorkeling with them; just avoid photos in which you harm or hurt them! Also, swimmers and divers are advised to keep clear of its large tail fin, which can accidentally hit and injure them. Tip: younger butandings tend to be more playful! It’s easy to stay abreast of butandings, which reach a top speed of, at most, 5 kilometers per hour; they move their entire bodies from side to side to swim. While their mating habits have not been observed, whale sharks are known to be oviviparous (eggs hatch and develop in the uterus of the female). They give birth to live offspring about 40-60 centimeters long. While the female can carry up to 300 embryos, only about 10% of these are expected to survive to birth, and these take 30 years to reach maturity. Once born, the mother leaves her offspring, making them vulnerable to predators. There are long intervals between pregnancies, though they are expected to live up to 150 years in the wild if left alone. 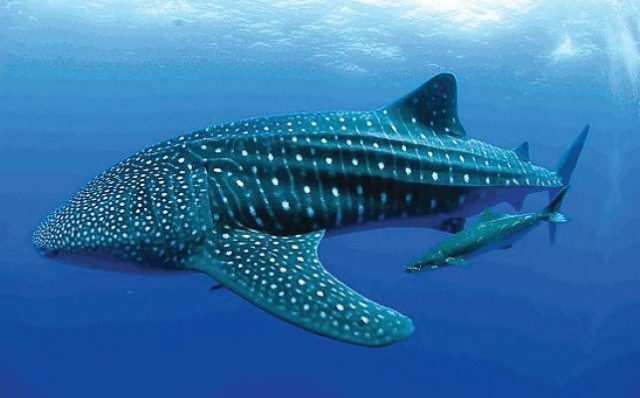 Given that the Philippines has the highest concentration in the world of whale sharks, when in 1998, it banned all fishing, selling, importing, and exporting of whale sharks for commercial purposes, this was a good move for the preservation of the species. India (2001) and Taiwan (2007) followed suit. What a lot of people don’t know is that the whale shark is an important part of the marine ecosystem, linked to the survival of creatures like crab and other fish, and even coral reefs. The International Union for Conservation of Nature considers the butanding to be a vulnerable species, especially crucial because there are no population records for it. • Al Hallaniyat islands in the Arabian Sea Did you know? Butandings can process over 6,000 liters of water per hour when they feed.